The United States Congress designated the Big Gum Swamp Wilderness (map) in 1984 and it now has a total of 13,835 acres. 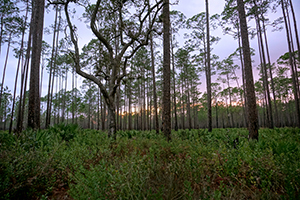 All of this wilderness is located in Florida and is managed by the Forest Service. This large, nearly level area consists primarily of a poorly drained to very poorly drained freshwater swamp of cypress and gum. The surface is a thick, spongy mat of organic material, sluggishly cut by a few shallow sloughs. Longleaf and slash pine flatwoods with a dense understory of saw palmetto, gallberry, and bay form the perimeter of the swamp. Loggers made off with most of the original timber between 1915 and 1920, and earthen railroad trams, some of which are still visible, penetrated the interior. Over time, all signs of human intrusion into the swamp have greatly subsided. A designated hiking trail makes a loop through the drier pine flatwoods of the perimeter on the west-northwestern side. Boggy terrain, dense vegetation, insects, and warm, humid conditions make travel here extremely challenging--exacerbated by the fact that the trails are not maintained (your best bet is to follow one of the many old logging roads). Deer hunters are the most common visitors. On the northwest side, an old road tunnels through a stand of massive live oaks that tower overhead. Planning to Visit the Big Gum Swamp Wilderness? How to follow the seven standard Leave No Trace principles differs in different parts of the country (desert vs. Rocky Mountains). Click on any of the principles listed below to learn more about how they apply in the Big Gum Swamp Wilderness.